In this application note, a comprehensive overview is given of the issues to be reckoned with when driving high-performance electrostatic MEMS (micro-electromechanical systems) actuators with high voltage amplifiers. First, we discuss the manufacturing of MEMS devices, their handling, and reliability. Next, MEMS actuation principles are introduced, and electrostatic comb drive and parallel plate actuators are explored in detail. Different types of springs are listed with their properties, and the actuation force and displacement versus voltage relationships are presented. These include normal comb drive motion, sideward instability, levitation, and parallel plate displacement and pull-in. In the following sections, we deal with the influence of parasitic dielectric charging on both comb drives and parallel plate actuators such as capacitive RF MEMS switches. This charging results in shifts or the disappearance of parallel plate pull-in and pull-out voltages. The important topic of how to get rid of the detrimental effects of charging, by prevention and electrostatic shielding, is covered in detail. In the last part, we turn our attention to how to properly drive electrostatic actuators. We cover current limiting to prevent device destruction, and bridge mode operation to double the actuation voltage. We discuss the combined effect of MEMS mechanical transfer functions and high voltage amplifier bandwidth, and show how the pressure of the air surrounding the device can be used to optimize the combined electrical/mechanical response of a MEMS actuator. Finally, we discuss how high voltage amplifier noise and thermal noise, and linearity, influence positioning resolution and accuracy. Being a high voltage amplifier design and manufacturing company, Falco Systems' does not (at the time of writing) develop MEMS itself. But we do know that many of our customers are working on the topics covered here every day. It is hoped that we can help many readers by presenting this information here, which is partially based on the authors' previous experience at IMEC, Leiden University, the TU Delft, and in different projects and user committees. Please feel free to contact the author if you have questions related to the topics covered in this application note. MEMS (micro-electromechanical systems, or micromachines) are small-scale mechanical devices that are produced using techniques that have been developed for the microelectronics industry. The quest for the smallest transistors has resulted in very advanced lithography, deposition and etching techniques for creating structures with well-controlled, exceedingly small feature sizes. These structures can have mechanical as well as electrical functionality, and this makes MEMS technology very powerful. 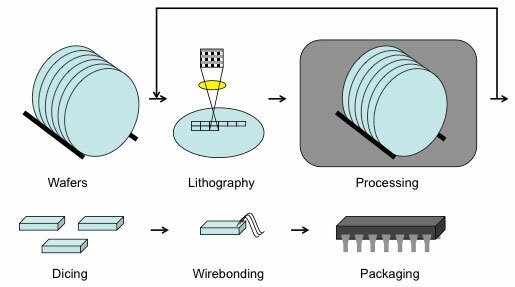 The process used to manufacture both MEMS and microelectronics is depicted in Fig. 1. 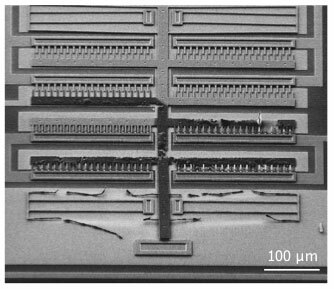 MEMS are fabricated starting from a mechanical carrier wafer. Layers of several materials can be deposited and/or grown, and their properties can be altered by adding impurities by diffusion or ion implantation. Features are made using advanced lithography: the small features are projected with light on a photosensitive resist layer. These features can be nm-sized these days for the highest density microelectronics processes, but for MEMS they are typically somewhat larger. This photoresist layer is developed to give selective access to the layer underneath. On the exposed areas material can be added or etched away. This sequence is performed a number of times until the structures are complete. The wafer is then sawn into individual circuits called die, which are placed in a package. The contact with the pins of the package can be made either by thin wire bonds, or by small solder balls. In the latter case the die has to be mounted upside down ('flip chip'). Where microelectronic structures such as transistors and their wiring are preferably well adhering to the wafer, the key to creating mechanical functionality on a chip is the ability to make free standing structures that can move. The three processes to achieve this are surface micromachining, SOI (silicon on insulator) and bulk micromachining. We will discuss all three in turn. In surface micromachining the mechanical structures are built by depositing layers on top of a wafer and selectively etching them. To obtain free standing structures, intermediate layers, called sacrificial layers, need to be etched away. The process is shown in Fig. 2. The materials traditionally used for surface micromachining are borrowed from the semiconductor industry. This is done because there is extensive knowledge about how to process these materials to form well-adhering, flat and mechanically stress-free films. The archetype process is embodied by the commercial MEMSCAP PolyMUMPS process , originally developed at the Berkeley Sensors and Actuators Center (USA). Designs can be drawn using large micro-electronics software packages such as Cadence, but also with simple, cost-effective solutions such as L-edit and CleWin. Because MEMS manufacturing takes place with advanced equipment with very pure materials in a clean room, the processing of a batch of devices is costly. PolyMUMS is a multiuser process, in which several users can provide the design for a small part of the wafer. After the manufacturing is completed, the users receive their respective parts and share the cost of the processing run. In this PolyMUMPS surface micromachining process, on a monocrystalline silicon starting wafer, layers of polycrystalline silicon (polysilicon, the structural material) are deposited, with silicon dioxide layers in between. The silicon oxide serves as the sacrificial layer and is etched away underneath the mechanical features, but it also serves to fix the anchors of the mechanical structures and isolate the electrical signals at the anchor points. How far the sacrificial layer will be etched underneath the polysilicon is called the amount of under-etch. Between the wafer and the mechanical structures is a silicon nitride insulation layer. Underneath the mechanical structures there is also a thin polysilicon routing layer for electrical signals. Gold is used in this process for the contact pads. Many more materials are now commonly used, such as aluminum alloys and advanced dielectrics. For an extensive overview, see . Recently the team of the author has even developed actuatable surface micromachined devices with a structural layer of boron-doped ultra-nanocrystalline diamond (UNCD)  at the TU Delft (The Netherlands), in collaboration with Argonne National Laboratories (USA). In Fig. 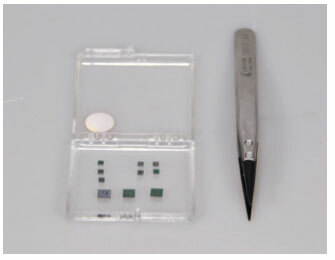 3, a number of PolyMUMPs surface Micromachined devices are shown as an example of what this technology is capable of. One of the disadvantages of surface micromachining is that the grown structural layers are necessarily thin. Thicker layers take a disproportionate time to grow, and tend to have internal mechanical stress gradients that cause the devices to curl up from the surface. SOI technology offers the possibility to use a hick structural layer, by bonding two wafers together with a thin silicon dioxide dielectric in between. The top wafer is then mechanically ground to the required thickness. Because of the thickness of the top layer, vertical features have to be etched with deep reactive ion etching (DRIE), while flat surfaces under a well-defined angle in the monocrystalline SOI layer can be obtained with a KOH wet etch. The SOIMUMPS process  is an example of such a process, again multiuser, and examples of structures made this way are shown in Fig. 4. In bulk micromachining, the carrier wafer itself is used as the structural material. The processing is very similar to the SOI process. It should be noted that combinations of these processes are often used. E.g. the manufacturing of MEMS pressure sensors and AFM (atomic force microscope) tips uses a combination of bulk and surface micromachining processes. Sometimes a recessed hole is etched in the wafer to place the surface micromachined MEMS devices in a 'pit' below the surface of the wafer. In this way, microelectronics can be added to the wafer in the usual way, but after the mechanical structures have been completed. MEMS can suffer from many reliability issues; see  for a comprehensive list. These issues are can be caused by flaws in the design, bad handling of parts, but mostly due to the forces of nature conspiring against you in the micro-domain. The latter makes the development of certain simple types of functionality very difficult, such as contacting or sliding parts. We go over the different issues in turn. Because of their small geometries, MEMS are very sensitive to contamination e.g. by dust particles. Commercial devices are invariably mounted in a protective package, and experiments with MEMS devices often take place in a clean room. The protective package is a simple hermetic package with a cavity in case of e.g. a MEMS accelerometer. Often chip level packages are used, such as anodic bonded silicon or glass frit wafer caps, or small caps that are soldered directly to the die. For MEMS with optical functionality, a transparent window needs to be provided in the package, while e.g. pressure and environmental sensors need access to the 'outside world', necessitating a thorough investigation of the effect of contamination on the device. In experimental situations, MEMS are invariably produced in a clean room, but sometimes tested outside. Whether this is acceptable should be assessed on an individual basis, as this can be different from device to device. MEMS are very sensitive to contact and particles. The accepted way of storing them as processed wafers or individual die is on a sticky foil in a closed wafer box or a small 'gel pack'. The latter is a simple small box, often transparent, with a layer of sticky gel at the bottom to keep the MEMS devices in place (Fig. 5). Because of the sensitivity to dust particles, handling of the die should only occur with plastic tweezers, or, preferably, metal tweezers with plastic tips. In this way, the generation of particles broken off from the sides of the die during handling is minimized. These particles are known to hamper device functionality. Also, preferably only open these storage boxes in a clean room. Devices that have to be kept for a long time can be stored before the release etch, typically one of the last processing steps, has taken place. As long as the devices are embedded in their protective sacrificial layer, they are much less sensitive, and can be stored in cheaper packages, in the same way as normal microelectronics die. MEMS devices that rely on electrostatic actuation (discussed in detail in this application note) are sensitive to electrostatic discharge (ESD) failures. These discharges are typically caused by tribo-electricity: a person walking on a carpet in cold, dry weather, or, to a lesser extent, sliding parts in a machine, can cause thousands to tens of thousands of volts of static electricity to build up. This electricity discharges upon contact in nanoseconds with peak currents of amperes. The corresponding energy can damage microelectronics and (electrostatic) MEMS alike. It is good practice to follow the guidelines (or, in case of a production facility, the norms) for correct ESD prevention. Work preferably takes place on grounded, conductive surfaces, and also ground people touching components, either with a wrist wrap, or using a conductive floor and conductive (over-) shoes. In an ideal world, MEMS gel pack storage boxes are conductive as well. Although the classical laws of physics normally govern their behavior, MEMS structures are so small that their behavior is still very different from what we are used to in the macroscopic world. By scaling down device dimensions by 10^3 times, the length becomes 10^3 times smaller, but the surface area reduces by 10^6, and the inertial mass by 10^9. 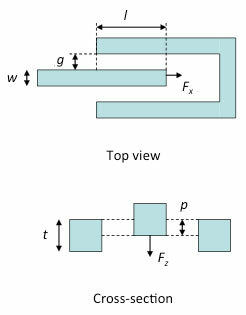 Due to their low mass, MEMS devices are relatively insensitive to g-forces and shock compared to macroscopic devices, and most work in any orientation, also upside down. Due to the high surface-to-volume ratio caused by scaling down the dimensions, MEMS are highly sensitive to anything that has to do with surfaces, such as adhesion, friction and wear. Adhesion occurs because the surfaces are very smooth: a typical value is a roughness of only 1 - 10 nm_rms, so the surfaces are really close to one another upon contact indeed. When surfaces are so close together, surface forces such as forces due to capillary adhesion, van der Waals molecular forces, electrostatic forces, hydrogen bridges between the surfaces, direct 'cold welding' contact and even quantum mechanical Casimir forces between conductive surfaces all add to the total observed adhesion force. If this total adhesion force is larger than the restoring spring force of the actuator, 'stiction' will occur, a failure mode where a moving part is stuck against another surface. A stiction failure is shown in Fig. 6. Special care has to be taken during the release etch of the device from its sacrificial layer. If the sacrificial layer is wet etched, rinsed, and then left to dry, the rinsing fluid (often water) will retract underneath the free standing parts during drying due to capillarity. There it will pull the structures down. This is caused by the force associated with the surface tension of water. When the fluid completely evaporates, it will effectively glue the parts of the MEMS device together by the 'coffee stains' of dissolved contamination in the water that are left after drying. This is often a problem with compliant MEMS structures and a typical solution is to displace the rinsing fluid with liquid CO2 that is brought to its triple point by high pressure and temperature. At the triple point there is no difference between the gas and liquid phase. In this way, no capillary neck will appear and the devices appear free standing without any force acting on them. Unless significant dielectric charging occurs (to be discussed later in much more detail) the largest adhesion force threatening free standing MEMS devices is typically caused by Capillary condensation. The surfaces of most MEMS structural materials are hydrophilic, and when they come in contact a thin layer of water appears between the surfaces due to capillary condensation of humidity from the air. The situation is depicted schematically in Fig. 7. In this equation gamma_l is the surface tension of water, v is the liquid molar volume, theta is the angle the contact angle of water on the surface, R the gas constant, T the absolute temperature, and RH the relative humidity. The force due to capillary adhesion is a large one: it is the same force that prevents us in the macroscopic world from separating two flat glass plates with water in between. 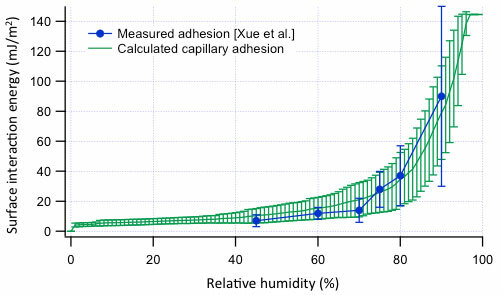 The dryer the atmosphere (so the lower the relative humidity RH), the smaller the value of d_cap, the smaller the amount of water between the surfaces, and hence the lower the force holding the surfaces together due to capillary adhesion. The strengths of the other forces mentioned above also have distance dependencies, although typically less abrupt than the one for capillary condensation. The rougher and the harder the surfaces, the lower the area in intimate contact will be, and the smaller the total surface interaction energy and adhesive force, and hence the more likely the device will not fail due to the stiction failure mode. The prediction of the exact magnitude of the adhesion force is cumbersome and prone to large deviations in practice. Into the models go the statistical distribution of the surface roughness, how the surfaces deform when they come into contact with a certain load force, and how all the surface forces interact as a function of distance. In Fig. 8 the result are shown of an experimental study of the adhesive force in MEMS devices by Xue et al. , compared with a simple plastic deformation adhesion theory taking into account the effect of surface roughness . The numerical values of the adhesion model are given with 'error bands'. These error bands are necessary because even though the roughness of the surfaces of MEMS devices is statistically identical, there is still an expected variation from device to device due to the stochastic nature of surface roughness. In the model, this expected variation is calculated, and the error bands given are the one sigma deviations in expected adhesion for a large number of MEMS devices tested. This device-to-device variation is real; the same order of magnitude variation is also observed in the experimental results except at very low adhesion values, where individual contacting asperities, 'outliers' in the distribution, have a disproportionately large influence on the adhesion. To the knowledge of the author, none has ever thoroughly investigated what happens to the liquid capillary condensate between the surfaces when the temperature of the device is suddenly brought below 0 degrees C, but freezing will surely have an influence on the adhesion that is experienced. Furthermore, it has been observed that adhesion 'ages', i.e. that the value changes (typically increases) after prolonged contact between the surfaces. No good models for aging yet exist either. Keep your MEMS dry! All in all, good experimental and theoretical information is available for the magnitude of short-term adhesion of hydrophilic surfaces only. Often, the measured adhesion is lower, due to hydrophobic (hydro-)carbon and other contaminants on the surfaces, but this effect is erratic at best. It is better to minimize the contacting surface area by including 'dimples' (little bumps) on the bottom side of the free standing device, and on other surfaces that may accidentally or intentionally come in contact. 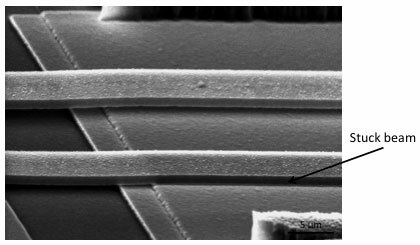 Often, the force due to capillary adhesion is still too high to be tolerated for compliant MEMS devices. In that case, a hydrophobic film can be deposited on the surfaces. Either a SAM (self assembled monolayer) , or a plasma deposited layer of hydro- or fluorocarbons ('Teflon-like')  can be added. These have been shown to decrease the adhesion and are relatively stable. 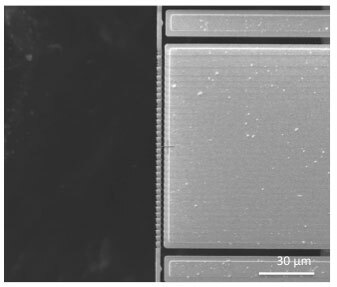 It should be noted that merely by imaging a device in a SEM (scanning electron microscope) at high magnification carbon is deposited on the surfaces of a MEMS device. This happens due to the cracking of carbon-containing molecules in the residual gas of the almost-but-not-quite vacuum conditions in the SEM column. This thin layer of deposited carbon can change the surface properties of a MEMS device with respect to adhesion enormously. If the situation with MEMS surfaces in contact is far from ideal, this is even more so if the surfaces are required to rub over one another, as e.g. in gears and sliders. Because of their small feature sizes, even a tiny bit of wear is sufficient to hamper device operation due to changing shapes, surfaces, and particle generation. The traditional structural material in MEMS is polycrystalline silicon, 'polysilicon'. Polysilicon was originally chosen because its characteristics and deposition techniques were well known from the microelectronics industry. Because it is brittle, it does not suffer from fatigue and creep, which is good for suspensions, but its tribological properties are not good. After a classical study by Sandia showed the wear of polysilicon micromotors , many solutions have been proposed and investigated. One of the possibilities is the use of adhesion- and wear-resistant hard coatings such as SiNx, SiC, Al2O3 tungsten, DLC (diamond-like carbon) and UNCD. It is difficult to deposit these layers conformally on all surfaces, and they often introduce mechanical stress gradients that change the device shape. In some cases it is better to use the hard layer as the structural material itself. SAM coatings, which are a good choice for adhesion reduction, rapidly wear off under sliding conditions and are not recommended. Another option is the use of liquid lubricants, e.g. thin oil or water. Because the relative speed of sliding MEMS surfaces is not high due to the small dimensions, correct lubrication (lift of the surfaces due to the motion of the lubricant liquid preventing contact) is often not achieved. In addition, the high viscosity on the small scale causes relatively high energy dissipation. Many applications also are not compatible with the use of liquid lubricants. Lubrication of MEMS is an active area of research, and the use of graphene and/or schemes based on atomic scale super- and thermolubricity may one day become a reality. Currently the most viable option from a commercial perspective appears to be VPL (vapor phase lubrication). The Texas Instruments DMD (Digital Micromirror Device) is a chip that contains a matrix of movable mirrors with steering electronics integrated underneath. It is used for projection systems such as beamers. The package of this chip contains an organic compound, which is normally solid but sublimates and deposits on all surfaces when the package is heated by the light of the projection lamp. The resulting thin film lubricates the surfaces where the mirror stoppers land and slide a few tens of nanometers . A comparable solution is the use of pentanol in the package, which has sufficient vapor pressure to form a lubricating film due to capillary condensation at the contact points between the surfaces . VPL also forms a hard, wear resistant tribofilm at the contact points during sliding. Hermetically sealed packages are required, as the presence of water severely reduces the effectiveness of lubrication by VPL. MEMS devices do not typically wear out due to long-term fatigue under cyclic mechanical stress (e.g. in resonance), because for fatigue to occur existing microscopic flaws in the material have to move to the surface and coalesce. MEMS are simply so thin that there are not enough defects to make them form a fatigue crack . Only when the mechanical stress is so high that new flaws are created, close to the yield stress of the material, will low cycle fatigue be a problem. In thin film silicon an environmentally assisted fatigue mechanism has been observed, even though silicon is brittle and should have no fatigue in the normal sense. Fortunately, this also only happens at very high stresses compared to the yield strength of the material, so in practice it is usually not an issue. Creep in metal MEMS at high temperatures is more of a problem than it is in macroscopic structures, but it does not occur in silicon. Magnetic forces do not scale well in the microdomain, but the electric field between charged conductors becomes very strong if the separation distance is small. This effect enables the possibility to use electrostatic actuators driven by high voltage amplifiers as a very useful way of generating displacements on the microscale. Electrostatic actuators fall in two broad categories (Fig. 9). When they make use of the change of the fringe field between conductors upon displacement as the driving force, the corresponding actuator is called a comb drive actuator. These actuators are used as long-stroke in-plane actuators. The change of the field in the gap between parallel plate conductors can give rise to a larger force, but exhibits an instability when the gap is shortened by more than 1/3 of the total gap width at rest. Therefore these actuators are typically used for small out of plane displacements and 'switching' type actuation only. We will discuss both actuator types in detail in the following sections. Other actuation mechanisms are also possible. If a large force is required, actuators based on thermal expansion are used, but contrary to their electrostatic counterparts they need a lot of electrical current and a low voltage amplifier. These actuators either consist of a hot and a cold beam in flexure hinges, or of a number of beams driving a shuttle under an angle (Chevron type), see Fig. 10. A third actuation method makes use of thin piezoelectric films that are deposited as part of the MEMS production process (Fig. 11). Unless resonance or mechanical amplification is involved, the displacements that these piezo actuators can provide are very small, but with a strong force. Piezo materials are also often used for bulk or surface acoustic resonators. The different types of MEMS actuators need different driving electronics. Driving electrostatic MEMS actuators is the traditional realm of high voltage amplifiers, as these actuators typically need between 10 and 200V to operate. Thermal actuators present a very low resistance to their driving source instead, and need a high current instead of a high voltage to make them move. High voltage amplifiers are not particularly suitable for electrothermal MEMS actuators. Low voltage, high current signal sources are required instead. Of course, if the output current of a high voltage amplifier is large enough to drive an electrothermal actuator, this can work too, but it is not a particularly energy- or cost-effective solution. Piezo actuators also need high voltage amplifiers if driven statically, but because they are often used in resonance, the drive requirements in term of driving voltage are typically lower than those of electrostatic actuators. In this application note we focus on electrostatic actuators, while noting that in some cases the topics discussed are also valid for piezoelectric MEMS actuators. This means that to determine the behavior of an actual MEMS device both forces need to be known. In this section, we discuss analytical models of springs, and in the next two sections the forces of comb drive and parallel plate gap actuators are presented. Note that the equations given here are very simple analytical models of rather complex electromechanical structures. They neglect anchoring point deformations, some fringe fields, and so on. However, they should give the right order of magnitude for the variables involved, and can be used as a fast reality check for MEMS designs, a 'quick and dirty' method to do a complete design or design assessment, and as a complement to FE- (finite element) modeling. In addition, contrary to FE modeling, they give a lot of insight into why things are as they are. All the functional parts of one- and two-sides clamped beams, comb drives and parallel plate actuators are described. In all cases, bent beams (cantilever and clamped-clamped) are used to define the displacement for a certain force. An equation summary form called quick_MEMS.pdf and an Excel sheet called quick_MEMS.xls can be used together with the current application note, and are available here. If the geometrical values are entered in the Excel sheet, it allows one to calculate voltages, forces, displacements, and so on, for typical electrostatic actuator geometries. The symbols used are the vertical thickness t, the length l and width w, and variations on the length l_c, l_a and l_b as indicated. The Young's modulus E is the material parameter describing the stiffness of the structural material itself. When using analytical linear approximations for the spring constants it is important to check in which direction the equation is valid; the in-plane and out-of-plane spring constant are almost never the same. It should also be noted that important contributions to the spring constant are not taken into account, such as anchor point deformations. There also device-to-device and lot-to-lot variations in spring constant due to manufacturing process variations. If a more accurate model of the spring constant is required, e.g. for large deflections where the linear models do not hold, or if other shapes are preferred, finite element modeling (FEM) can be a solution. In these software packages one cannot only model the spring constants, but they can also be used to describe the electric fields, thermal effects and influence of air pressure in great detail. Well-known software packages are e.g. COMSOL Multiphysics and ANSYS, but good simulations can also be set up in general purpose environments such as Mathematica and Matlab. A warning is appropriate here: the results of a computer simulation are only as good as the model put in. It is difficult to directly measure stresses due forces and deformation in a metal, but for semiconductors such as silicon, Raman spectroscopy can be used . In a micro-Raman spectrometer, a small probing laser spot is focused by a microscope, and the scattered light spectrum is collected and analyzed. This scattered light contains frequencies not present in the incident laser beam, due to inelastic scattering processes in the sample caused by the interaction of the light with phonons. From the shift of the Raman spectral peaks with respect to the incident laser frequency (measured with a high-resolution spectrometer and a sensitive, liquid nitrogen cooled CCD camera), the mechanical stress in the material can be measured with a spatial resolution equal to the size of the focused laser spot, typically 0.5 to 1.0um. Care should be taken that the sample is not heated by the laser beam, because temperature differences will also show up as a Raman peak shift in the spectrum. In a stroboscopic measurement even the evolution of (cyclic) mechanical stress can be followed. In Fig. 12 the mechanical stress mapping is shown of a silicon MEMS membrane under pressure. To make sure that the displacement of the comb drive actuator in the x-direction does not become too large, many designs include stoppers that limit the maximum in-plane displacement. The contact area of these stoppers should be small; otherwise a stiction failure might occur and the device still fails. As these stoppers are in well-defined locations due to the fact that they are defined lithographically, they can also be used for displacement calibration. 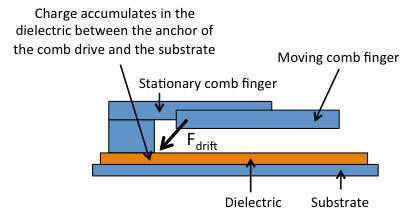 Comb drives do not only move laterally, but generally also exhibit a significant out-of-plane motion. This happens because the electric field forcing a comb drive to move is not symmetrical in z (Fig. 14). This field has the effect of pulling the moving comb drive fingers up, 'levitating' the comb drive actuator out of the plane of the stationary fingers. This is the reason why, in the actuated case, usually p is not equal to t as illustrated in the comb drive geometry (Fig. 13). The levitation stops at a certain height when an equilibrium is found, which often happens already at relatively low actuation voltages. In Fig. 15, levitation is shown as observed in the SEM. 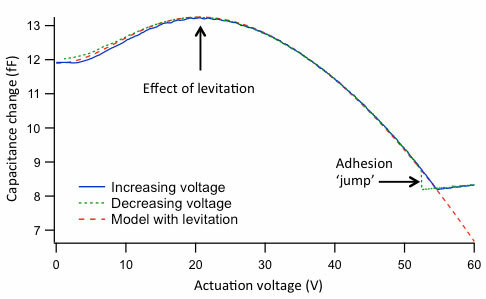 Note that most of the levitation takes place al low in-plane displacements, and that the actuation electrodes become darker when the actuation voltage increases due to the fact that in the SEM we image with electrons (called voltage contrast). The variables z_0 and gamma_z are not know a priori, and difficult to analytically model, because they depend on the shape of the fringe fields of the comb drive actuator. A FE (finite element) computational model is more appropriate to predict the behavior, if required. However, if the capacitance between the fingers is measured as a function of the actuation voltage, the magnitude of the levitation can be extracted from the measured curve . This allows one to fit a function to the measured curve and obtain z_0 and gamma_z from the fit. Fig. 16 shows a typical measurement of the capacitance change as a function of the actuation voltage of a polysilicon MEMS comb drive actuator. In this experiment, the actuation voltage is applied between a set of stationary combs and a set of moving combs, while the capacitance is measured between a similar set of combs without actuation voltage across them. This is done to facilitate the measurement of the small capacitance changes involved (aF to fF). While one would at first expect the capacitance to go down when the comb drive is levitated out of the gap, it in fact becomes higher as more fringe field lines can now terminate on the device (this is why the comb drive wants to levitate in the first place). This effect dominates the capacitance change, until at higher actuation voltages the pull of the actuation combs dominates: in this regime the capacitance decreases quadratically, as the moving comb fingers are pulled out of the measurement comb gaps. Figure 16. The capacitance change of a comb drive actuator as a function of actuation voltage clearly shows the effect of levitation. A stopper at 2um displacement is used as displacement calibration, and adhesion of the comb drive shuttle against the stopper is clearly visible as a sharp 'jump' in the curve with decreasing voltage. From a fit of this equation to the experimental curve in Fig. 16, the fit variables can be obtained. To have an idea of typical values: for this curve, the fit returns z_0 = 0.5 um and gamma_z = 1.5 nN/V^2*m.
Besides using a capacitive measurement, the in-plane displacement of a comb drive can also be assessed optically with a normal (research grade) microscope. In these optical measurements, the levitation cannot be seen, unless interferometry is used, e.g. with a Mireau microscope objective. The displacement resolution required for monitoring comb drives is usually well below both the optical resolution of the microscope and the size of the pixels of the camera. 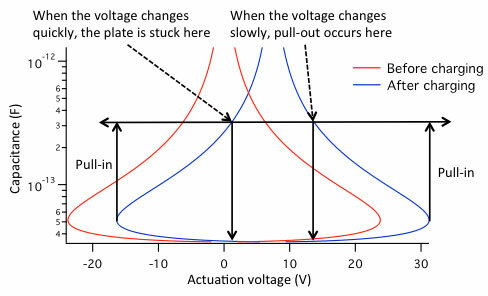 Hence, a curve fitting or similar information extraction technique needs to be used to make the displacement versus actuation voltage graphs. A good example is the technique presented in , with sub-nm resolution. In Fig 17, the power of this curve fitting technique is illustrated. A set of images of a feature is taken at consecutive actuation voltages. In the next step, intensity plots of these images are created by adding together rows of pixels. A peaking curve such as a Lorentzian or spline function is then fitted to every intensity plot, and the location of the moving feature (e.g. a beam) is extracted with high resolution. If possible, both a moving and a stationary feature should be fitted. The displacement is then corrected by the difference in location between the two. Taking the difference of two feature positions theoretically increases the total position noise by sqrt(2). But the fact that vibrations and other disturbances related to the microscope and sample holder are 'subtracted out', because they are common to both positions, more than compensates for the loss in theoretical resolution. The software to perform this curve fitting is available online for public use at . Parallel plate actuators are typically stronger than comb drive actuators per unit area, because they have a larger overlap capacitance between the stationary and the moving parts of the actuator: The parallel plate actuator does not rely on the fringe fields for its operation. Fig. 18 shows the basic geometry. In Fig. 19, the displacement versus actuation voltage is given for a typical device. The pull-in is clearly visible. Note that, once pull-in has occurred, the actuator will not pull out, even if the voltage is reduced to below the value for pull-in. This is caused by the fact that the distance between the plates has decreased to zero, and hence the electrostatic force has effectively become infinite for any actuation voltage other than zero. The pull-in phenomenon limits the maximum displacement of parallel plate actuators used e.g. as z-direction scanners to less than one third of the gap distance, which is a severe limitation, and is in fact one of the reasons for the existence of comb drive actuators. In a real parallel plate device, if pull-in would occur, the actuation voltage will be short-circuited. Because of the high current capability of typical high voltage amplifiers, this will result in melting of the device and a host of other failure modes. Pull-in can be very desirable though for actuators that are to be used as switches. Because MEMS switches are so small, they can be used for switching very high frequency GHz range RF (radio frequency) signals. Here the sudden, non-linear displacement en subsequent seizure by the high electrostatic force ensures excellent on/off behavior. This also ensures that the switch stays on or off in the presence of large acceleration forces ('g-forces'), such as when the device is employed in a rocket or dropped on the floor. If the actuator is to be pulled down in such a switch, a dielectric or residual gap should be present between the plates in the actuated, pulled-down state to prevent short-circuits. Switches with a metal-to-metal contact can be used from DC to very high frequencies, while capacitive RF MEMS switches with a dielectric between the plates can only be used at high frequencies where the capacitance of the device in the on state represents a low impedance. MEMS metal-to-metal contact switches have traditionally used gold as the contact material, but for certain applications, a more durable metal - or alloy - may be preferred. Inspiration can be found in the alloys used by the manufacturers of macroscopic relays. Cleanroom compatibility of these contact materials may be an issue though. The operating principle of both types of switches is given in Fig. 20. Measuring the capacitance changes of a parallel plate actuator to determine the out-of-plane displacement is actually easier than in the case of a comb drive, because the capacitance changes involved are typically somewhat larger, especially if the device exhibits pull-in. 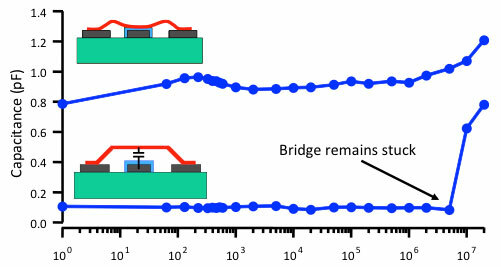 An example of a capacitance measurement of a capacitive contact RF MEMS switch during a high switching cycle reliability measurement is given in Fig. 21. Why such a MEMS switch fails (here at 5*10^6 cycles) will be discussed in the next section. The out-of-plane displacement of parallel plate actuators can also be assessed with a dedicated interferometer measurement setup. Good commercial solutions for this purpose based on laser Doppler vibrometry and white light interferometry are available from companies such as Polytec and Bruker (Veeco/Wyko). In the important case of a parallel plate actuator where the plate lands on a dielectric, such as in a capacitive RF MEMS switch, the influence of the dielectric needs to be considered in the model of the previous section. If a high voltage amplifier actuation voltage is present across the dielectric when the plate is pulled down, or when ionizing radiation is present, charge will accumulate inside and/or at the surface of the dielectric. This charge will influence the device behavior and cause premature failures, so this effect should be carefully considered. Both the case without and the case with charging will be considered. The corresponding geometry is given in Fig. 22. In Fig. 23 the capacitance change as a function of plate displacement is shown. Most of the capacitance change occurs when the moving plate is close to the dielectric. Surface roughness or particle contamination can have a large effect on the obtained capacitance in the down position, because both prevent a complete closure of the gap between the moving plate and the dielectric. Usually the capacitance seen in practice is considerably less than theoretically predicted from this equation, exactly due to these effects. In addition, often, if the moving plate is not stiff, e.g. it is part of a bridge-like structure, it will 'unfold' over the dielectric at higher actuation voltages, causing an additional increase in capacitance as the actuation voltage is increased above the pull-in voltage. The C_on/C_off capacitance ratio of a capacitive RF MEMS switch is an important figure of merit. Figure 24. 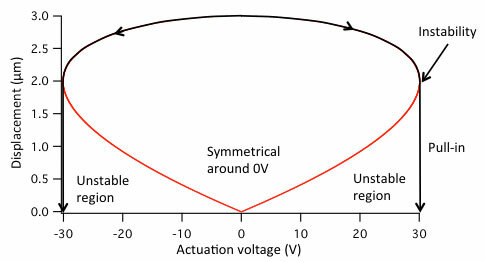 Displacement versus voltage curve for the device defined in Fig. 23. Due to the V^2 term the curve is symmetrical around zero; note that the maximum displacement is 2.5um, instead of the 3um of Fig. 19. The displacement versus actuation voltage with no parasitic charge present is shown in Fig 24. This curve is similar to Fig. 19, except that the gap is not completely closed when the moving plate is in down position. The plate lands on the dielectric, and an actuation voltage larger than zero is required to keep the plate in the down position. 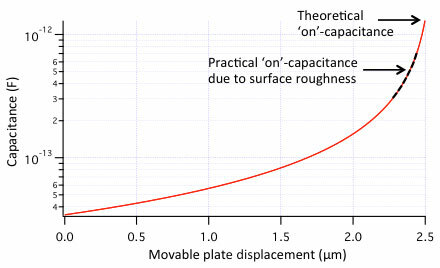 If the contacting surfaces are rough, the actual minimum 'holding voltage' can be considerably larger than calculated here, just like the capacitance in Fig. 23 is smaller than theoretically predicted. When the plate is in the down position, a small parasitic current can flow from the top to the bottom plate through the dielectric. This Poole-Frenkel conduction through the dielectric is usually responsible for the charging mechanism , in the same way that the threshold voltage shifts in MOSFETs with a high-k dielectric. Using the equations above we can plot the actuation voltage versus capacitance curve (or, equivalently, voltage versus displacement curve) with a certain amount of parasitic charge present (Fig. 25). The shape and displacement of the curve of Fig. 25 combined with the mechanical dynamics of the device can give rise to fairly peculiar behavior. If one only measures the C/V (capacitance versus voltage) curves slowly with a C/V meter, the only effect that will be observed is that the whole C/V curve slowly shifts due to charging over time. This may a problem if the actuation voltage shifts so much that the pull-in and/or pull-out voltages cannot be reached anymore with the high voltage amplifier driving the parallel plate actuator, but appears otherwise harmless. However, in a real application the electric drive signals from the high voltage amplifier are usually fast compared to the mechanical response of the MEMS switch (e.g. square wave actuation). In this case the behavior is completely different! Again refer to Fig. 25. If the device is in the down position, and suddenly the actuation voltage is removed, it will be still in the down position, but now with zero actuation voltage over it. If we look up this point on the C/V curve, we see that the device remains stuck. In a slow, unipolar (only positive-going) C/V measurement we never reach this point, but under real actuation conditions we do. As soon as the negative pull-out voltage crosses the zero line, the device will appear stuck when actuated with a square wave, but comes back to the 'up' position if we do a slow scan of the voltage. These transition speed-dependent actuation effects can be fairly puzzling until the mechanism behind this behavior is identified. Other effects related to charging can also occur. If the charging behavior is not uniform, different areas of the dielectric will pull on the moving plate at different actuation voltages. This has the net effect of narrowing the C/V curve, and in extreme cases the pull-out voltage point completely disappears. In that case, the moving plate will be stuck down at all possible actuation voltages, including zero. Another important point to watch out for is creep. Creep in the spring of the moving plate  (which is often an aluminum alloy to obtain the high conductivities necessary for good electrical performance) can easily be misinterpreted as charging. A very different type of charging occurs when devices are imaged in the SEM. If the insulation resistance between the different parts of the MEMS device is large, the charge deposited by the scanning electron beam can actuate devices without any electrical connection whatsoever. Fig. 26 shows this behavior, where a clamped-clamped beam made in a SOI micromachining process is actuated sideways by the structure next to it. This structure on the side has a very large surface area, and hence many electrons from the imaging electron beam are accumulated at this part. The suspended beam appears 'ragged'. It should be noted that the SEM uses a scanning technique hence different parts of the image have been made at different moments in time, with time progressing along the direction of the suspended beam. Upon closer inspection of the 'raggedness', one can discern in it many small pull-in events, complete with the right shape of the displacement curve. Once the moving beam touches the large plate on the side, the resulting short-circuit event causes the charge imbalance to be neutralized, after which the beam returns to its original position and the charging cycle starts again. Not only parallel plate actuators but also comb drive actuators can suffer from charging to a certain extent. The high voltage between the stationary combs and the wafer substrate cause the dielectric in between to charge. While only the fringe fields of this charge can be seen by the moving comb drive shuttle, they can still cause a drift of the actuation voltage curve, and of the magnitude of the levitation. Fig. 27 shows the principle. An extreme case of a related effect was seen by Knudson et al. . MEMS comb drives used in an acceleration sensor for space applications should have high radiation hardness. The initial device suffered from drift in a test where the devices were exposed to ionizing radiation. The device had a dielectric underneath the comb drive to prevent accidental shorts between the comb drive and the substrate. Although there was no voltage across the dielectric, it was still charged by the ionizing radiation. Removal of this layer cured the drift issue (Fig. 28). Figure 28. The build-up of charge due to ionizing radiation can be prevented by removing exposed dielectrics. This was proven in the case of this accelerometer sensor , resulting in a rad-hard design. Both comb drive actuators and parallel plate actuators used as scanners can benefit from the addition in the design of grounded shields. These shields can form a conductive surface between the charge fringe fields emanating from the dielectric and the moving parts of the device. The field lines from the dielectric, if present due to charging, will then terminate on the shield instead of on the moving parts. The basic implementation of such shields is shown in Fig. 29. Similar considerations can applied to parallel plate actuator designs. Charging of this dielectric can be minimized in several ways. One is to carefully tailor the properties of the dielectric: a very low leakage dielectric with very little parasitic current results in very little charging over the lifetime of the device. It should be noted though that parasitic leakage current usually increase very fast with increasing temperature. In the opposite philosophy, a very leaky dielectric instead allows the quick removal of any built-up charge. In the latter case, there is a (possibly temperature-dependent) maximum time that the device can be operated in the down position before it sticks. Then it should not be actuated for some time, to allow for the charges to flow away. Designing a very low spring constant spring for the parallel plate actuator allows for very low actuation voltages. As the charging typically goes exponentially with the voltage across the dielectric, this certainly helps. Actuating the device with a high voltage pulse and then keeping it down with a lower 'holding voltage' helps, as does actuation with both positive and negative voltages to reverse the charging. These possibilities are shown in Fig. 30. Neither of these solutions seems to be entirely satisfactory to prevent long-term reliability problems due to charging and subsequent stiction. No fully reliable capacitive RF MEMS switch has been described in literature to date where there was an actuation voltage directly across the dielectric in the actuated state. Designs with no actuation voltage across the dielectric intrinsically have a much higher resistance against charging. If the dielectric is omitted and replaced by 'stoppers', switch-type actuation can still take place using a voltage on the stationary plate of the parallel plate actuator. Disadvantage is that the C_on/C_off ratio suffers because there is now a thin layer of low epsilon_r material (air) in between the plates. Another solution is to keep the dielectric, but move the actuation to separate lower actuation plates. The design should be such that when the moving plate is pulled in, it touches the dielectric but does not make a short circuit with the actuation plates. Both design solutions are depicted in Fig. 31. Metal-to-metal contact switches necessarily have a similar design with separate actuation electrodes, and can hence be made insensitive to charging too. However, metal-to-metal contact switches suffer from difficult to solve degradation mechanisms on the small scale in the metal-to-metal contact itself. If parasitic charge can change the C/V curve of a capacitive RF MEMS switch, the same is true of any high frequency RF signal between the plates, which acts as an extra actuation voltage. In extreme cases the effective voltage of the RF signal is higher than the pull-out voltage of the switch, so that the RF signal alone is enough to keep the moving plate down once actuated. This is an absolute higher limit on RF signal amplitude for the operation of a parallel plate actuator as a switch. A more subtle effect is that the signal voltage across the dielectric can also charge the dielectric somewhat, so even designs with separate actuation plates should be carefully checked for charging effects. As the maximum change in voltage due to the signal is equal to the signal amplitude, a safe signal voltage level at which charging due to the signal alone can never cause enough C/V curve displacement to cause charging is less than half the pull-out voltage. In this case both the self-actuation of the switch and the charging are both limited to less than half the pull-out voltage, and stiction due to electrical effects will not occur. A comprehensive review of the work on charging and the reliability of MEMS switches is given in . How a MEMS electrostatic actuator behaves in practice is for a large part determined by the electrical drive signals. Typically, electrostatic MEMS in experimental setups are driven by high voltage amplifiers. Once a device is ready for commercialization, a custom circuit is designed that can either be co-integrated with the MEMS device or mounted close to it in the final application. 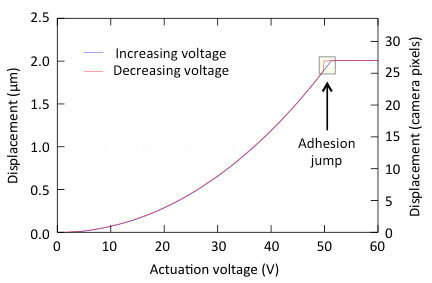 Fundamental studies, such as those related to adhesion and friction, with no direct commercialization purpose, also use high voltage amplifiers to drive the devices. The properties of the amplifier are very important. We will discuss several aspects in turn. accidentally come in contact, the resulting large short circuit current can cause extensive destruction on the small scale (Fig. 32). Placing a large value current limiting resistor (e.g. 1M-Ohm) in the actuation voltage line can prevent this. This resistor is a good solution when only slow displacements are required, as the current for actuating an electrostatic MEMS actuator is then negligible. For high speed operation, such a limiter is usually not a good idea, due to the high currents required for charging and discharging the parasitic capacitances. High speed dynamic currents are discussed later in this section in more detail. If higher voltages and the correspondingly larger displacements are required, thicker dielectrics can be used. Instead of using higher voltage amplifiers, another option is to use two amplifiers in bridge mode. This can be done in tree ways (Fig. 33). The first is the 'classical' bridge mode operation. In this mode, one set of comb fingers is connected to the output of the high voltage amplifier, and the other set of the same comb drive not to ground, but to another amplifier that provides the opposite polarity of the first amplifier. In this way the effective voltage across the comb drive is doubled (e.g. 700Vpp for two 350Vpp amplifiers such as the WMA-100 high voltage amplifier). For this purpose, Falco Systems has two phase inverters available to drive the two high voltage amplifiers required for bridge mode operation. One is optimized for high speed (the WMA-IB-HS model), the other one for lowest noise performance (the WMA-IB-LN model). These phase inverters will provide two outputs, one with the original (buffered) signal, and a second output with the same signal in opposite polarity. If a comb drive is designed with two independent sets of comb drives on the opposite sides of a single shuttle, another option to extend the displacement range is available. It is not possible to extend the range by driving an electrostatic actuator with both positive and negative voltages, due to the F ~ V^2 relationship. What can be done instead is to send actuation waveforms to both comb drives, but only to one at the time. The voltage on the first set will move the shuttle one way, and the voltage on the other set will move it on the opposite direction, effectively doubling the range. This can simply be done with two independently driven amplifiers. But, almost equally effective, this function can also be obtained using a single amplifier with two diodes and two resistors. In the latter case, the positive voltages of the amplifier are relayed by the diodes to the first comb drive, and the negative voltages to the other comb drive. Due to F ~ V^2 both comb drives will pull on the shuttle in turn, and the displacement is doubled. The actuation voltage will be one diode drop (around 0.6V for normal silicon diodes) maximum on the 'wrong' set of comb fingers. If this voltage drop cannot be tolerated, two independently driven amplifiers are needed. MEMS devices often have high mechanical resonance frequencies, and hence can move very quickly. The high voltage amplifier should have a high bandwidth so that its drive signals do not unnecessarily slow down the device. The best is to use an amplifier with a bandwidth significantly higher than the resonance frequency of the device. This can be seen as follows. If the high voltage amplifier has an ideal first order low pass filter response, its output voltage will be 3dB (sqrt(2)) down at the given bandwidth frequency. The MEMS device would experience a 6dB (sqrt(2) * sqrt(2) = 2) times reduction in possible displacement due to the quadratic nature of the force versus actuation voltage relationship for comb drives, and even more for parallel plate capacitors. The drive reduction effect begins to show up well before the given bandwidth of the amplifier is reached. If the device dynamic behavior is to be observed, a fast high voltage amplifier is necessary indeed. Fast high voltage amplifiers for MEMS need to have not only a high small signal bandwidth, such as opamps typically have, but also a very high slew rate. 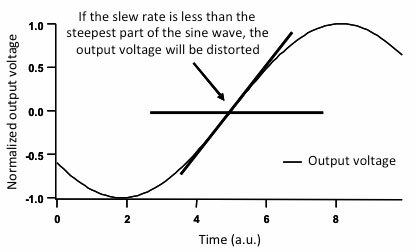 The slew rate is the maximum change of voltage as a function of time (the maximum slope dV/dt) of the output voltage of the amplifier before distortion due to the limited transition speed occurs (Fig. 34). It is typically given in V/us. High speed high voltage amplifiers such as the Falco Systems WMA-100 and WMA-300 models can reach a few hundred, to, in the case of the WMA-300 amplifier, even 2000V/us. If the required output current is larger than the current limit of I_L ampere of the amplifier, again slew limiting will occur, but now at a lower slew rate S_I than the intrinsic slew rate of the amplifier, because the capacitance cannot be charged faster than with the maximum current available. MEMS devices themselves represent a fairly low capacitance, and often the connecting (coaxial) cables and/or bondpad-to-substrate dielectric are the largest source of capacitance. Coaxial cable typically represents 100pF/m. The shorter the cable from the output of the amplifier to the MEMS device in a high speed MEMS experiment, the better! Internal currents inside the amplifier to charge the internal device capacitances also go up as the speed increases, so high speed high voltage amplifiers are always high power amplifiers, even if the output current required is low. For more information about the speed limitations of high voltage amplifiers there is a separate application note available here. Here one will also find an online calculator to calculate bandwidths, slew rates and maximum output voltages based on the maximum current of a high voltage amplifier. Critical damping is the fastest response that a mechanical or electronic system can have without generating overshoot if subjected to a step input. The mechanical transfer function performs the same type of filtering on the force versus displacement relationship as an electrical filter does on input versus output voltages. In general, the displacement will lag the electrical drive signal by the amount given by the mechanical transfer function. 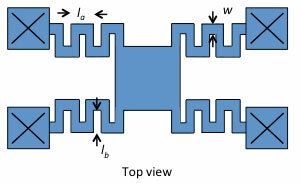 The damping ratio is determined by material properties and air damping, and in MEMS often the air damping dominates. Comb drive actuators are typically underdamped in 1 atmosphere of air, while parallel plate actuators, with their much larger surface area, are typically overdamped. Indeed, it is not unheard of for a MEMS actuator to be underdamped in one direction of motion, and overdamped in another. It can be that the lateral displacement of a MEMS comb drive actuator is underdamped, while the out of plane levitation is overdamped, giving rise to very peculiar time lags at higher actuation frequencies. Capacitive switches have a position-dependent damping in the out of plane direction, because they suffer from squeezed film damping. The smaller the air gap between the movable actuator plate and the surface below, the more difficult it becomes to squeeze out the air in between. This thin layer of air 'cushions' the impact upon pull-in. Such non-linear damping can best be modeled with FEM simulations. In Fig. 36 the effect of air damping on the behavior of a capacitive RF MEMS switch is shown. At normal air pressure the system is heavily overdamped, and the mechanical response is slow. 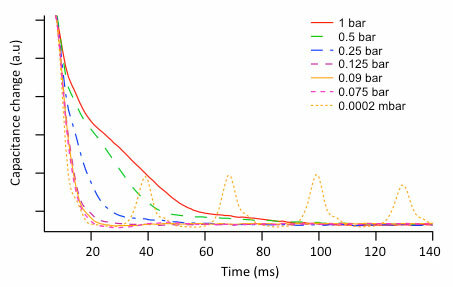 Squeezed film damping slows down the response even more when the gap is almost closed (1 bar curve, 50 - 100ms interval). In vacuum, the response is very fast, and underdamped. Severe contact bounce is observed upon pull-in. At a pressure in between, critical damping is observed: at this pressure the device response is the fastest without artifacts appearing. If possible in the application, a hermetically sealed cavity can be used in the MEMS package (e.g. on the die itself, called '0-level packaging'). This cavity can then be sealed with the correct air pressure inside. The small and accurate displacements of MEMS devices make them very suitable for precision displacement stages and other precise positioning tasks. As long as charging (discussed earlier) is negligible, the repeatability of the displacements can be excellent. With silicon as the brittle structural material, essentially no creep or fatigue is possible unless the deformations are extreme. Piezoelectric MEMS are less suitable for high precision positioning, because piezoelectric materials exhibit hysteresis (see the Falco Systems piezo application note). Electrostatic actuation (with well-shielded actuation surfaces against charging, Fig. 29) is preferred. This means that the actuator position noise will be determined not only by the output noise voltage of the amplifier, but also by the actuation voltage itself. This can be seen as follows. As the actuation voltage increases, the displacement goes up quadratically. The incremental displacement at higher voltages is hence higher than near zero for an equal change in voltage. The same happens to the noise voltage. 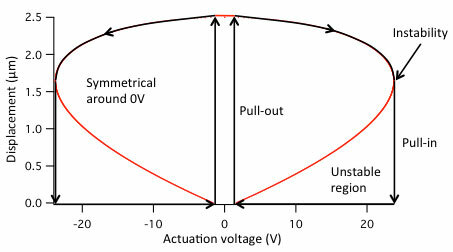 The utmost in displacement resolution will be reached at low actuation voltages, where the slope of the displacement versus voltage curve is low. The resolution can be extraordinarily high. As an example, the Falco Systems WMA-200 ultra low noise high voltage amplifier has a noise level of 50uVrms and a large signal bandwidth of DC - 100kHz. A typical comb drive actuator which displaces 2Î¼m at 70V actuation voltage has a proportionality constant Î± relating voltage an displacement, calculated as 2um = alpha*70V^2, alpha = 0.41nm/V^2. The corresponding position noise as a function of actuation voltage is plotted in Fig. 37, and is, when a WMA-200 amplifier is used, far less than the dimensions of an atom at all actuation voltages. It should be noted that the noise voltage and the corresponding position noise quoted here are very low indeed. It is important to use a signal source (function generator, D/A converter, control loop circuitry, ...) that has the same low noise performance. Well-engineered analog circuitry can be better in this respect than D/A (digital to analog) converter based solutions. The noise level quoted for the WMA-200 high voltage amplifier (50uVrms with a range of 350Vpp) corresponds to a D/A converter bit depth of roughly 23 bits. Only the very best 24 bit D/A converters have a noise low enough to distinguish 23 effective bits, and usually this can only be achieved in a bandwidth considerably less than DC - 100kHz. In this equation k = Boltzmann's constant, T the absolute temperature, and c the mechanical damping factor (in Ns/m) as defined earlier. The corresponding force noise is given in N/sqrt(Hz) and has to be multiplied with the square root of the mechanical bandwidth to obtain the total position noise due to thermal noise. In case of a critically damped second order system, the spectrum is flat, but the effective bandwidth is 1.11 times the -3dB bandwidth . This correction is made to account for the noise present at higher frequencies, as the mechanical filter is not infinitely steep. The thermal noise of a MEMS comb drive actuator at room temperature (293K), with a 100kHz mechanical bandwidth, is indicated in Fig. 37, in addition to the electronically induced position noise. The larger of the two noise terms will dominate the total position noise as the noise terms add as the root of the sum of squares. For comparison, the electronically induced position noise caused by the WMA-100 general purpose high voltage amplifier is plotted in this figure alongside the noise of the WMA-200 ultra-low noise high voltage amplifier. This WMA-100 amplifier has 350uVrms output noise, but in a larger bandwidth of DC - 500KHz. The effective noise as filtered by the mechanical response of the device has a bandwidth of 1.11*100kHz, hence the 350uVrms noise is reduced by 1.11/sqrt(5) by the mechanical response of the MEMS device. 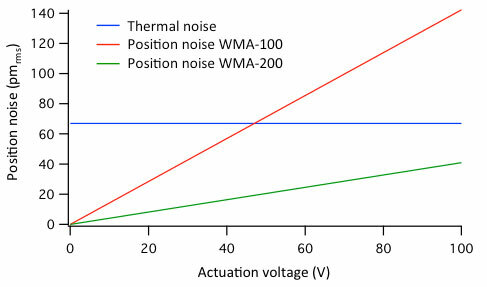 Where the electronic position noise caused by the WMA-200 high voltage amplifier is lower than the thermal noise at all reasonable actuation voltages, the WMA-100 high voltage amplifier noise will dominate the position noise for output voltages above 45V, and will already add to the total noise at voltages considerably lower than that. Choosing the right amplifier here makes an important difference to the attainable positioning resolution! The electronic noise on the position has several consequences. In a parallel plate actuator geometry, the displacement versus voltage slope goes to infinity at the instability point, and hence also the position noise goes to infinity there. In practice this means that the pull-in voltage is not fully deterministic, but that a noise band of pull-in voltages is present, which shows up if the pull-in voltage is measured many times . Also, the mechanical bandwidth goes down near the pull-in point due to electronic damping. It is interesting to note that, due to this V*v_n multiplication, the intrinsic position noise of piezoelectric actuators is better than of MEMS devices. 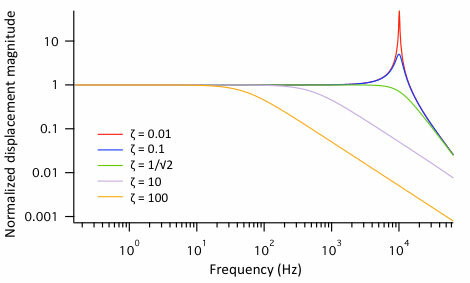 Piezo's have many other challenges, such as resonances, hysteresis and creep, but their response to an actuation signal is to first order linear, so that the V*v_n term is not present in the equation for the position noise. The comprehensive application note "Driving piezoelectric actuators with high voltage amplifiers: Piezo materials, applications, precision, speed and damping of resonances" is available here for more information. If the MEMS electrostatic actuator is used as a variable capacitor, e.g. as a capacitive sensor or capacitive MEMS switch, any position noise will cause a corresponding capacitance noise. The amount of noise present can be calculated in a way similar to the analyses above for comb drive actuator noise, and the RF MEMS switch capacitance curves discussed in the charging section. Depending on the application, this noise will limit the ultimately attainable resolution of a sensor, and it will cause parasitic sideband noise signals in a MEMS switch. In the case of the capacitive switch, most problems due to noise would be with the actuator plate in the up position. Fortunately, in the 'up' position there is hardly any voltage induced displacement noise (2*V*v_n = 0, only the v_n^2 term remains). In this situation, the noise is typically governed by thermal noise only. As the actuation voltage on a capacitive MEMS switch or sensor increases, the capacitance noise goes up. While the positioning resolution (smallest discernible change) of electrostatically actuated silicon MEMS devices is extraordinary (if a good, low noise high voltage amplifier is used, that is), the positioning accuracy (exactness of the 'right' position) warrants further scrutiny. Several aspects of the system influence the accuracy of the positioning with electrostatic MEMS actuators. 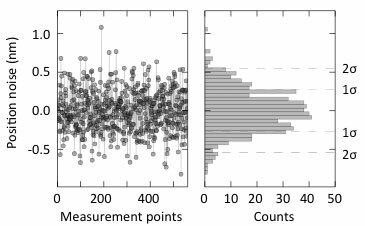 The accuracy of the positioning has two components: repeatable but unknown errors, and non-repeatable error contributions. Repeatable contributions are e.g. the deviation from the perfect ~ V^2 displacement of a comb drive due to levitation (non-linear error) and the accuracy with which the proportionality constant alpha (in nm/V^2) is known (linear error). Repeatable high voltage amplifier non-linearity errors inside the amplifier also fall in this category. Non-repeatable errors are caused e.g. by (piezo) hysteresis, plastic deformation (fatigue and creep) of the MEMS device, dielectric charging, and (temporary) thermally induced changes in high voltage amplifier performance due to fluctuations in dissipated power. The 'repeatable' accuracy limitations can in principle be eliminated by a one-time, careful displacement calibration measurement. Device to device variation due to manufacturing processing irregularities limit the usefulness of such a calibration procedure, unless it is performed on every individual device. The non-repeatable accuracy errors are the ones that fundamentally limit system performance. It is not unheard of for a MEMS actuator system to have sub-pm resolution but an accuracy in the (tens of) nanometers. High accuracy is achieved with tight manufacturing tolerances, high-linearity amplifiers for driving the actuator, grounded MEMS shields against charging, and brittle, creep and fatigue resistant structural materials. Not only the MEMS device and the high voltage amplifier should have low noise and high linearity, but, as said, the signal source should exhibit these properties as well. In this application note we have covered many theoretical and practical concepts, and issues, that should be taken into account when using high voltage amplifiers with electrostatic MEMS actuators. We have seen that device handling is very important, and that not only manufacturing but also reliability considerations should be taken care of early in the design process. We have investigated the design of structures for a specific spring constant in considerable detail. Together with models for in-plane (comb drive) and out-of-plane (parallel plate) electrostatic actuation, these allow for calculating actual displacements of electrostatic MEMS actuators. Charging effects are very common in MEMS devices with dielectrics. Both a model to describe the effects caused by charging, and measures to prevent charging or its consequences, have been discussed in detail. The influence of the drive signal of the high voltage amplifier has been elucidated as well. A model has been presented for the position resolution of a MEMS actuator that can be expected in the presence of high voltage amplifier and thermal noise, and we have seen that with an ultra-low noise amplifier, the combined position noise can be in the picometers. The factors influencing positioning accuracy have also been listed. Together with high voltage amplifier slew rate limitations and both mechanical and electrical filtering this provides a complete picture of the dynamic behavior of electrostatic MEMS actuators. Of course, this application note can only be the start (or a small part along the way) of a successful MEMS development cycle. We have listed many of the issues to be reckoned with, and have given guidelines for high performance actuators and their drive signals. Compared to macroscopic machinery such as e.g. car engines, most current state-of-the-art MEMS actuators are still deceptively simple. But at the same time, due to the multitude of factors at play at the small scale, their development into high-performance products is very challenging. Many devices do not make it from the laboratory to the marketplace because their performance and/or reliability is just not good enough. The road from a prototype to a product is an expensive and long one, and more difficult than the prototype development itself; it should be planned well in advance. Successful products such as e.g. the DMD projection chip, MEMS microphones, pressure sensors, acceleration sensors, and gyroscopes, prove the point. With all the different possibilities and enormous potential, MEMS technology will increasingly make its mark upon society. The author would like to acknowledge his (former) employers at IMEC vzw, Leiden University and Delft Technical University, and the funding agencies STW (Veni and Vidi program) and FOM (free physics research program) for facilitating the work that laid the foundations for this application note. Although due care has been taken to ensure that the information contained in this application note is correct, Falco Systems does not assume any liability arising out of the application or use of any of the information described herein. Falco Systems reserves the right to make any changes to this application note without further notice. All text and images are (c) Falco Systems. P. F. Man, B. P. Gogoi and C. H. Mastrangelo, Elimination of post- release adhesion in microstructures using conformal fluorocarbon coatings. J. MEMS, 1997, p. 25. M. R. Douglas, Lifetime estimates and unique failure mechanisms of the digital micromirror device, Proc. Of 36th International Reliability Physics Symposium (IRPS), 1998. p. 9.